Erzullie Icon and Plus Size Model, Carol Perla, has always been known for doing and having it all. 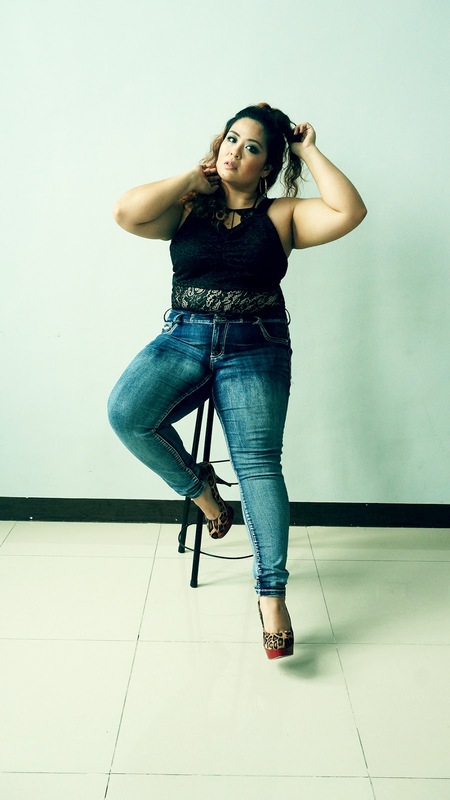 A mother, hair and make-up artist, actress and of course, model, now another title is added into the mix --- she is the stand-in Editor in Chief of The Big Side Plus Size Magazine. We come in to get the inside scoop on her experience so far. 1. Model, Mother, Hair and Make Up artist and now a stand-in editor of an online plus size magazine in the Philippines --- THE BIG SIDE. How do you find the time? That's everybody's question. I try to set aside time for each and every task that I may have. I'm relatively lucky, because I don't get as much schedule conflicts - I have great work relationships with the outfits I work with, so I am able to do this whole juggling act for the longest time. And I love bringing my kids to see my Erzullie fam, or even when I'm doing makeup gigs. I hope they think I'm cool to be doing all these things. 2. Why did you take in the assignment? I offered help on last year's anniversary issue and worked on it with Kath (EIC and founder of TBS). After that issue had been published, she told me she had to take some time off to work on some personal business. So I took on the job and it's been crazy and wonderful. I love how people have responded to TBS since the beginning, so it concerned me that it might take another while before another issue is worked on/released. And since Kath is on a break, I told her I would help keep it afloat while we await her return. 3. What are your duties as a stand-in editor? Usually I pick out the central theme of the shoot, down to setting dates for the shoot and doing the write-ups. Doing some photo and interview editing. And of course, releasing the issues! Haha. It is a daunting task, and doing the back end stuff was loads easier when Kath was around. But I promised her that I wanna keep the magazine afloat while she's on her vacay. I really hope I've been doing my job right. Hahaha! Challenges are always part of the mix: shoot dates, theme, waiting for your models to send in their interview responses, editing -- time is always of the essence. And of course the outputs have to really be publish-worthy, haha! Doing the end to end work is a really difficult process, but if you want results you won't waver till you see everything through! 4. What are the lessons that you have learned about yourself through being a stand-in editor? Lesson 1: Be on time. Nothing wastes productivity if deadlines are not met on time. I learned that sometimes you have to be firm with deadlines -be it with others or yourself because you won't have enough hours to produce the best output if you let everything get delayed. Lesson 2: People will still say something negative with your work, no matter how hard you've worked on it. It's not wrong to hear these comments but you have to take things in stride. So stick with your vision, but take the negative comments with a grain of salt. Remember, all comments may help pave the way for better work. Lesson 3: Be patient. Working on projects like The Big Side pose a lot of challenges. It helps to keep a cool head because sometimes frustration sets in - especially in the creative process - there are so many times you will hit a wall. But just keep working on it. You're gonna feel better once you see the output. 5. As a stand-in editor, eventually, you will have to give it back to the originator. Do you have plans to pursue your own publication path? Why and why not? That's an idea. It sure sounds great, and I would love to do something like TBS. But I think I'd be just as happy to help out with TBS, whether it's in front or behind the camera. And if I ever do something similar, it would probably be published using two mediums: video and photo. Maybe in a year, I can start a Youtube channel, who knows? Hello Erzulliestas! If you want to find out more about the Big Side and be a part of this community, like us on Facebook: thebigsideph - You will see that just like the Erzulliestas, The Big Side is here to help inspire, empower and show you that body positivity isn't just a trend: It is a movement that we will want to keep going.